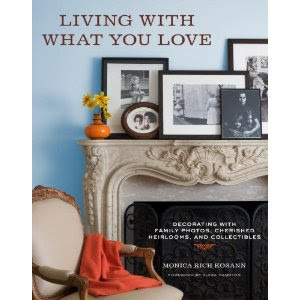 Several weeks ago, I saw a magazine article featuring the book Living With What You Love: Decorating With Family Photos, Cherished Heirlooms, and Collectibles. I was fortunate enough to be in the midst of a week of children's camps, so I leisurely took myself to to the bookstore, perused the pages of the book, fell in love, brought it home, and read it cover to cover in one sitting. In the book, author Monica Rich Kosann encourages readers to become comfortable with certain aspects of clutter. Specifically, any clutter that in truth portrays family meaning. Well, you all know how I feel about clutter (still have half my house in storage and just can't bring myself to drag all that stuff back into my little home...a whole other book, I know!!) But, based on the premise of a blog full of my family's photos and stories, perhaps you are inherently aware what I am even more passionate about ~ those family photos and stories! Yet, as Kosann asks, "Where are you hiding your Kodak Moments?" Mine are tucked into boxes or stuffed five-deep in old frames or worse yet sitting in a file on my computer. Save a small handful. Kosann discusses the inevitable hallway of photos so many of us have or grew up with in our homes. The single wall where our entire childhood evolved upon its drywall or plaster. Perhaps the windows of our past showed up there in the images of grandparents or great-grands. Cousins. Aunts and Uncles. She calls it "The Happy Hallway." My mom had a wall like that when I was growing up. She moved it, fully intact, to every location she settled. And to this day, I can be found pausing to look upon the pictures I already know by heart. A sense of home engulfs me each time I look at the great-grand I most resemble. The fading images of generations past vying for spots amongst the pictures of my own children on their grandmother's wall. It is comforting to know they all belong to me and I to them. Kosann writes about this very feeling ~ its universality. Recently, I visited a friend's house for dinner. True to the author's words, I found myself looking at the photographs on Lisa's wall of her children over the years. I couldn't tell you a sentence about any other art in her home. But I recall in detail the photos she displayed of her three children throughout. I understood the importance of family in this home. Am I demonstrating the importance of my family in my home? This weekend, I put aside any and all other chores and pulled dust-covered boxes out of storage. I found pictures of me when I was a child, of my husband, of the twins as babies when we diligently spent tons of money on all those series of baby photos...of Meiners, Sash, grandparents, aunts and uncles and cousins. I began with an old china cabinet and displayed a few favorites in it. Then I took the rest and started piecing together the frames like a puzzle. All the way up the staircase from the basement. I'm not finished yet. I have more photos and I want to request a few from family. But it's already making a difference. Sashi came upstairs this morning and said, "It's pretty, Mommy. [The Happy Hallway.] Show me where I am. Am I born yet?" I asked all the kids at dinner if I should remove the photos from the china cabinet. There was a resounding, "NO!" They like to look at them. And talk about their favorites.